Over 2000 trees planted. Read how we do it. Phuket’s myriad attractions can make it hard to pick a destination to stay in, and to find the right villa that meets all your vacation needs. Here’s where we step in to help you find the perfect holiday home - whether you’re here for the beach, restaurants, culture or tropical vibes. We’re excited to share our knowledge of the island and help you seek out the best spots for your holiday, so don’t hesitate to give us a call. Phuket’s hotspots are scattered along its western coasts. Patong, with its lively beach ambience, plentiful dining and shopping attractions and energetic nightlife scene is a traveller’s favourite. For a more laidback feel, venture to Kamala, a town known for its lush greenery and family-friendly setting. Northwards of Kamala lies Surin; living large here is easy, thanks to the destination’s paradisiacal beaches and variety of luxurious accommodation. Bang Tao, located next to Surin is an oasis of calm - just right for families seeking a restful retreat. The south of Phuket offers something for every traveller. Kata and Karon beaches are for vacationers seeking a vibrant beach atmosphere, Nai Harn exudes a tranquil charm and Cape Panwa’s remoteness will appeal to holidaymakers seeking to get away from it all. The serenity of east Phuket, combined with its hillside villas with sea views makes it a popular choice for rest and relaxation. Venture all the way up to the north, and you’ll discover a slice of paradise in places like Phang Nga and Natai Beach. Its picture-perfect landscape and diversity of nature attractions are what draws vacationers to this part of the island. With most attractions located within a half hour to an hour’s drive away, there’s little need to move about between different locations during your stay in Phuket. Half-day and full-day tours are a great way to explore the island, and your villa manager will offer ready assistance with tour and transport arrangements. "I would like to special thanks the team at Villa-Phuket. com. Your team is efficient and helpful to answer all our enquiries before our trip!" What can Villa-Phuket.com do for you? We are specialists of Phuket villas! Our expert team knows Phuket like the back of their hand and has personally inspected and selected the vacation rentals we offer. Give us a ring and tell us what sort of holidays you're after and our villa consultants will match you with the perfect Phuket villa in our portfolio. You can reach us every day (including weekends). If you are more comfortable in another language, know that we also speak French, Indonesian, Dutch, German, Chinese and Spanish. After discussing your travel plans, your villa consultant will shortlist a few available properties within your criteria and budget. Our direct contracts with villa owners in Phuket guarantee the best price as well as a direct and reliable view of their availability. You will therefore be able to place a free option on the villa you like. This option means you have 72 hours to discuss your villa holiday plans with your friends and family. Once you have all the information you need to confirm your reservation, you will be able to pay your rental directly to Villa-Phuket.com, Singapore-registered company, for a safe and secure booking. Our team of villa concierges will assist you during your stay: from your arrival with an airport pickup, all the way your departure. 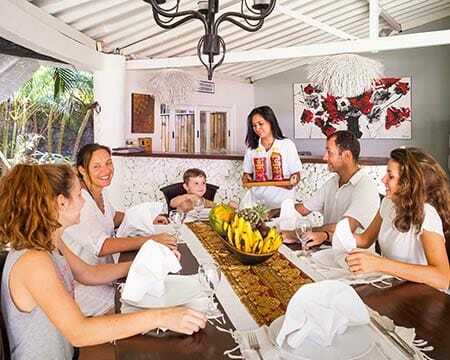 Contact them to arrange a chef for your in-villa meals, babysitting services, or any other special request you may have during your stay. Have a great holiday in Phuket!